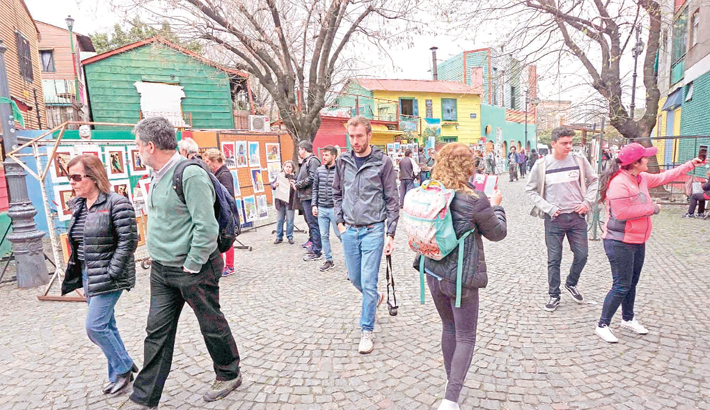 Tourists visit the traditional street museum Caminito in La Boca neighbourhood in Buenos Aires on Friday. Foreign tourists have been favoured as the peso has lost more than half of its value against the dollar since the start of the year -- as Argentina battles to stave off an economic crisis. BUENOS AIRES: Argentines may be feeling the pinch of their country’s economic woes, but for tourists, the troubled peso is proving a holiday boon. Brazilian Pedro Perreira de Azevedo has been rubbing his hands in delight after his family holiday, with his wife and three children, turned out cheaper than expected, reports AFP.